And now here I am almost halfway through my Master’s degree in psychotherapy. Am I prepared for a profession where I will be working through the most intimate details of a given person’s life? No. But will I ever be fully ready for the real life hardships, joy, trauma, and mess that will come into my office everyday? Probably not. I am already learning that people are extremely complex. I am learning that the thoughts and actions that take place in private, the lived experiences, both good and bad, vary so greatly and yet in some ways seem to relate to one another in a mysterious, basic human capacity. We all feel, we all breathe in and breathe out. But as a budding psychotherapist, there are a few things that I have learned about this profession that seem so foundational to really just relate well to people. Maybe you have people in your life that are difficult to deal with. Maybe you are being faced with the hardships of others. Maybe you are a bit stuck with all of the talk of mental illness that is on the forefront of every study, political conversation, and news story. It is a complex subject, and you will never be expected to be a therapist but there are some basic principles that may be helpful in your everyday profession, conversations, and relationships. As I’ve been reflecting on my past year of education, I have come up with five practical lessons I have learned. Basic? Yes. Essential? Absolutely. One of the most generous things you can give to a person is the ability to talk openly. Have you ever experienced this yourself? It is amazing how when you are given the space to just talk, to speak what you are thinking out loud, how much clearer things start to become. To have someone really listen to you, without interruptions, and not try to push advice on you when you are finished is a serious gift. One of the biggest things I have learned this year is that as a therapist you don’t give advice. This was a bit of a surprise to me! I feel that most people go into therapy hoping that the therapist will tell them what to do! This is where being a therapist highly differs from being a friend. Advice giving is encouraged in a friendship; it is part of the conversation. The problem comes when people try desperately to relate to the problem, hardship, or challenge that a friend is expressing. Take the words, “I know what you mean” out of your vocabulary. There is a place for you to express to a friend that he or she is not alone, that others have been in similar situations. But in that moment, it is better to listen than to turn the conversation toward your experience, your time when, really just yourself. When you are in a tough place, you are likely not going to be comfortable. And if you are fortunate enough to have someone expose to you the difficulties in his or her life, don’t expect to be comfortable looking into it. People are going through things that are messy and uncomfortable. Yet, it is in this place that truth can be found, it is deep in the soil that seeds can be planted. Don’t try to shove them out of it, but rather let them set the pace, walk alongside, journey with them. It seems that too often there is a perception around mental illness that if a person were to just do A, B, or C they would be fine. Just get up and take a shower and you will feel better. Just shake it off. Just forget about it. All of these things sound great but in reality, it is not that easy. It is important that we are willing to extend grace to the people we come in contact with, to have patience, to encourage. Now, this is often easier said than done, but it is essential. I often find myself sitting in Starbucks as I do work. In fact, I am sitting in Starbucks as I write this. And it is absolutely amazing to me how many conversations I overhear about God, both good and bad. People are curious, fighting, resisting, questioning and discovering. Lives get changed over cups of coffee. I have seen it happen in my own experience, but I seem to bear witness to it on a weekly basis. The complexities of relationships are very real, especially when hardships and difficulties come along. And yet, we have the opportunity and ability to seek out peace, patience, kindness, goodness, faithfulness, gentleness and self control from He who not only loves but actually is love itself. He is the great counselor, the provider, and the healer. With everything I have learned, with all of the challenges that come along with relationships, reliance on him is by far the most essential component. 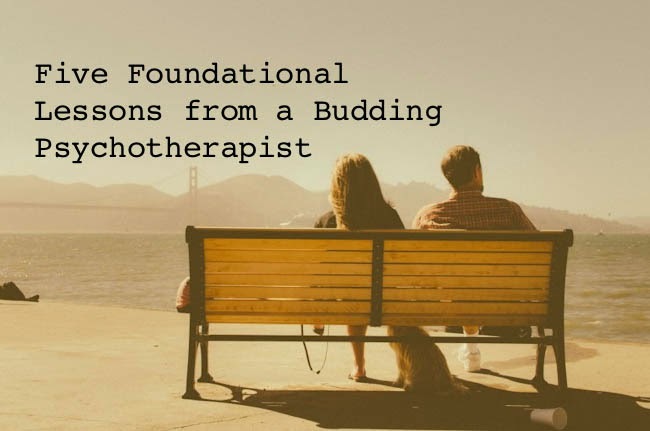 And so, whether you find yourself as someone interested in the profession of therapy or just trying to be a good friend, there are some things that I would call essential to developing good relationships, and really, these are just a few. I have a lot to learn, and I need to continue to stabilize my foundation. But as a budding psychotherapist, I am excited to keep building.